Open a Duane Swierczynski novel and prepare for whiplash. Wherever you think his plot is going, it’s not. And when you think he’s headed down a one-way road, he screeches, swerves, and pummels through whatever blockade you thought prohibited such a turn, then rockets through uncharted terrain, always with two hands on the wheel, never lost, following a route only he knows. Because for all the twists and turns, there’s never any doubt: Swierczynski knows exactly where he’s headed and how he’s going to get there. Following a successful trilogy of thrillers, Swierczynski has returned with a standalone novel: Canary. Honours student Sarie Holland is book-smart, not street-smart. A hard-working teenager who rarely strays too far from the straight and narrow, one bad decision sets in motion a chain of events that changes her life – and her family’s – forever. The one time she does something slightly brash – offering a ride to a college crush – she pays the ultimate sacrifice. The guy she’s crushing on is a low-level dealer. And while she’s waiting for him one night, thinking the only act she has committed is a kind favour, a Philly narcotics cop nabs her. Detective Ben Widley is desperate to clean up his city; fuelled by an almost unstable fervour, he reckons Sarie’s non-boyfriend holds the key to dismantling a key link in the Philadelphia drug chain. And so, young Sarie Holland becomes Confidential Informant #1373 – Widley’s canary, in other words – and enters the brutally violent world of the Philly underground, just as police informants start disappearing from the streets, presumed dead. Canary boasts a large cast of characters, all of whom have their moment in the spotlight, and Swierczynski deftly flicks between perspectives as he ratchets up the tension. Swierczynski pulls off improbable plot twists with aplomb, linking these characters’ stories together. His sparse style is perfect for such a convoluted tale; there’s nothing burdening the novel’s raw pace. At its heart though, it’s a family tale: Sarie’s dedication to her brother and father, following the death of her mother a year earlier, is its emotional hook, and this remains prevalent. Despite the violence and bloodshed, Canary has heart. Without it, the novel would be little more than loud noise; with it, it’s something special indeed. 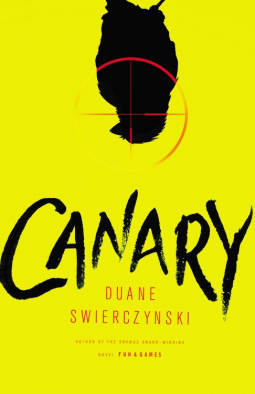 Canary is an intricately plotted and spectacularly structured crime thriller, demonstrating Duane Swiercyznski’s mastery of the form and underlining his status as one of the genre’s A-Grade authors.